A truly beautiful bifold wallet crafted from genuine Italian leather that is embossed with the Wurkin logo on the front and text on the inner.This new style is large enough to carry Euro currency so if you're a traveller, you'll find this a very handy travel companion.New credit cards constantly transmit your personal information digitally through the use of a Radio Frequency Chip which can be used to make contactless payments in stores now.Wurkin Stiffs wallets are fused with a thin alloy matrix inside the outer layer of leather that blocks RFID transmissions from your credit cards.This guards against your personal credti card information being stolen by hackers and fraudsters while you're not paying attention.So not only is this wallet incredibly stylish, but it's playing defense for you too! With quality stiching detailing around the edges and accent strip on the outside, this wallet is all about class and sophistication with bold style.This wallet has 8 storage pockets - incredible for a wallet that is so slim.The colour trims in beautiful lines act to highlight and contrast the black embossed Italian leather.We just love these wallets and we know you will too. 2 internal extra pockets for receipts, club cards, ID etc. WHAT IS RFID? Radio-Frequency IDentitfication) refers to the transfer of information from a small chip and antenna. WHY DO YOU CARE? Given technology's speed and ease to communicate information, RFID devices are now incorporated into credit cards and passports, without the consumer data protected. PROTECT YOURSELF! Wurkin Stiffs Wallets create a barrier protecting the data from unauthorized access. 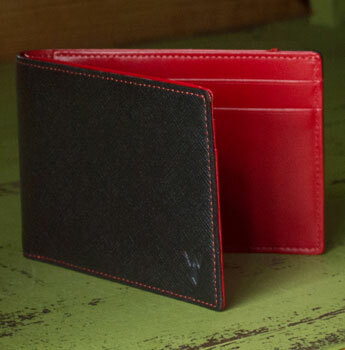 Your identity is safe with Wurkin Stiff's collection of RFID blocking wallets.